Dirty condenser coils have been shown, in independent studies, to increase your energy consumption by up to 26% depending upon the severity of the contaminants. 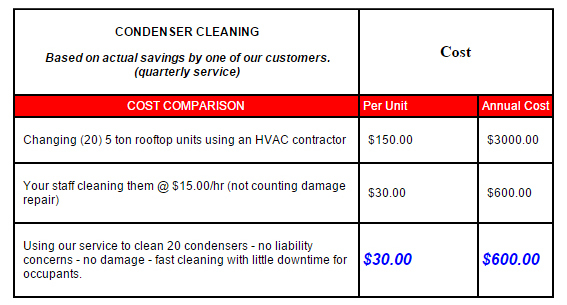 Condenser coil cleaning is the most cost-effective preventative maintenance you can perform on your units. 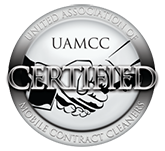 The return on investment on condenser coil cleaning is usually less than two months and sometimes can be recouped in as little as a week. A three ton unit consumes, on average $180.00 of energy per month. If the condenser coil is not cleaned and becomes fouled with a layer of dirt, dust or plant material, the cooling ability of that 3 ton unit goes down to that of a 2 ton unit. Meanwhile, the cost of running the unit goes up by 25% leaving you with a monthly cost of $226!!!!! In this example, if we clean your condenser coil for $30.00 you will recoup that 30 dollars in THREE WEEKS of operation leaving rest of the season to put the SAVINGS back in your OPERATING BUDGET!!! How many tons of air conditioning are on your roof costing you money at this very moment? Normal energy cost - $60.00/ton/month - 20 units - 100 tons - Total CLEAN Cost $6000.00/month. Our filter service $124.97 (per month serviced quarterly) + coil cleaning $600.00 per year or $50.00/month)= $174.97 per month. $191.03 BACK IN YOUR OPERATING BUDGET EACH MONTH!!! This example is from a small 30,000 square ft office building.